[Episcopal News Service] The bracket is packed with big names. The matchups can be intense. Individual results may hinge on last-minute momentum shifts. And in the end, only one competitor claims the title of champion. March Madness? No, this is Lent Madness, and the saint who outlasts them all will be crowned with the Golden Halo. The Rev. 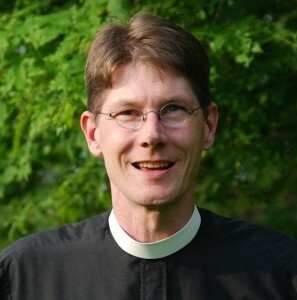 Tim Schenck, an Episcopal rector in Massachusetts, created Lent Madness in 2010 as a feature of his blog. Two years later, he partnered with Forward Movement and added a “co-conspirator,” the Rev. Scott Gunn, Forward Movement’s executive director. 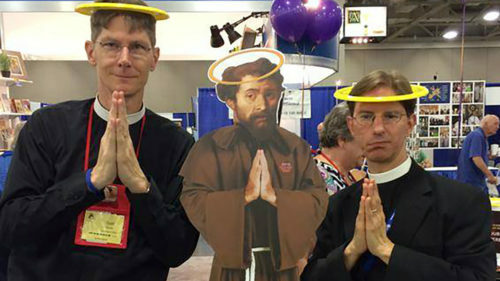 Since then, Lent Madness has grown so popular among Christians of all denominations that the tournament’s website typically draws about 100,000 during the 32-saint competition. Each day, fans are asked to vote on one of two saints after learning about the saints by reading their carefully crafted Lent Madness biographies. Up to 10,000 votes are cast each day, Gunn said, and players can mark the results on an official Saintly Scorecard. Schenck and Gunn don’t condone gambling, but churches and other organizations are invited to use bracket pools as fundraising tools for charity. “Who wouldn’t want to tell everybody in their parish that they’ve won Lent?” Schenck said. Schenck and Gunn spoke to Episcopal News Service by phone March 22 with Lent Madness fast approaching this year’s Golden Halo matchup on April 12, the Wednesday before Easter. It appears that Lent Madness has absolutely nothing to do with sports. That said, are the two of you basketball fans, and do you follow the actual March Madness? Schenck: The reason that I started Lent Madness in the first place was I got tired of basketball fans having all the fun this time of year, while Christians would give things up and eat twigs and that kind of thing. I’m a huge sports fan, and I thought, wait a minute, let’s combine these two things: saints and brackets. Of course, they would go together brilliantly. And so, I started this project on a whim, and it’s now evolved into what it is today, partly because of our partnership with Forward Movement. Sometimes, Scott will talk about being the Don King to my Muhammad Ali, which in other words, would make me the greatest and it would give Scott bad hair. But seriously though, Forward Movement has done a tremendous amount to promote Lent Madness over the years, and Scott and I have worked together to get the word out. That’s what’s been the leaven in the Lent Madness bread to make it grow. Scott, are you a basketball fan? Gunn: No. I’d be lying if I said I was. But I’m very competitive. Lent Madness has developed quite a following. Do you or your followers ever engage in a kind of divine trash talk about who should win? Schenck: We, as the Supreme Executive Committee, are of course impartial. But we do encourage trash talk on social media, and that absolutely does happen. Gunn: When Tim started Lent Madness the first year, when he was doing it on his blog by himself, I was a participant and I wanted George Herbert to win. And so, before I was supreme and had to be neutral, I ran a vicious smear campaign against Julian of Norwich and Teresa of Avila. Which succeeded, I might add. So that’s why George Herbert won the first year, because I was like the Karl Rove of Lent Madness. But now you can’t do that, right? Gunn: Exactly, it’s like when you watch the State of the Union Address and the Supreme Court justices sit in their black robes, and they can’t smile or stand up or clap or anything. Tim and I are just exactly like that, except if we were wearing robes they’d be purple, of course. Schenck: But we also do have the same amount of job security as a Supreme Court justice has, because we’ve appointed ourselves for life. This is the eighth year. How much time and effort do you put into planning the bracket and then overseeing the matchups? Schenck: A tremendous amount. When I did all the writing by myself the first two years of Lent Madness, I don’t remember Lent 2010 and 2011, safe to say. But we have a tremendous amount of support and help, not just through Forward Movement, but we have 11 celebrity bloggers. And our celebrity bloggers are the ones that do the bulk of the writing for the matchups, and they do a tremendous job in bringing these saintly souls to life. Schenck: A secure undisclosed location. Gunn: Yes, we meet in a secure undisclosed location that’s usually a coffee shop, and it usually takes a couple days to organize the bracket and decide how to get the matchups organized and who to put in there. And then over the summer, the celebrity bloggers under a great veil of secrecy write the first entries and we work on the saintly scorecard. And it’s now a tradition that the bracket is unveiled on Nov. 3, which is All Brackets Day. You have All Saints, Day Nov. 1, All Souls Day, Nov. 2 and All Brackets Day, Nov. 3. So, this is a year-round process. Schenck: Oh yes, we’re in the business of perpetual Lent. Do you go into each tournament with a sense at the start of who will win the Golden Halo? And how on Earth did St. Francis of Assisi lose in 2010? Schenck: I never fill out a bracket, because I am always wrong. Anyone that I think is going to win does not. So, I’ve stopped even trying. Scott, do you fill out a bracket? Gunn: We have a bracket pool here at Forward Movement to raise money for charity, so I fill one out for that purpose. But I don’t usually do that well. I’ve never won. Schenck: So, insider information doesn’t help. Gunn: St. Francis is actually a great example. He didn’t do very well in 2010 and then he cruised all the way to victory in 2015, so you just never know. I think a lot people were stunned and considered it to be an upset that Joan of Arc lost this year in the first round. So, you just never know. Schenck: Just as with March Madness, there are Cinderellas and there are upsets and lots of drama. Gunn: My hope for Lent Madness is always that it’s inspiring for people, that people learn something from this and that people have a good time playing it. I don’t really care so much who wins or who loses as [much as] is there an interesting figure that people are learning about? I guarantee you a lot more people know about Samuel Isaac Joseph Schereschewsky because of Lent Madness than otherwise would know about him, and his story is really inspiring. I’m proud of Lent Madness for making his story more well know. Schenck: The whole notion of saints competing against one another is patently absurd. They have all won their Golden Halos in Heaven. They have nothing to worry about on that score. It’s all about putting out some inspiring stories and getting people to know some well-known saints in deeper ways and also being introduced to some more obscure figures who did some saintly things in their own time. Is there any way that the works of a saint could be compared to a Michael Jordan dunk or block by Shaq? Schenck: I don’t know, I think all these saints would be members of the Dream Team, so there’s that analogy. The two of you clearly seem to be students of the saints, it sounds like your followers are too. Gunn: Lent Madness seems at first like it’s about the competition, and then when you look at it a little more you see that it’s really about learning about saints. And then when you look at it more closely again, you see that it’s about how God works in ordinary, messed-up people to do extraordinary things. And that’s what we hope one of the points of Lent Madness is, that all of us might be inspired to see God at work in our own lives, even maybe occasionally inspired by a little bit of silliness. When you say ordinary, messed-up people, what do you mean by that? Gunn: Well, we’re all sinners and nobody’s perfect. Schenck: We literally put saints up on a pedestal, whether it’s on statuary or stained glass or oil painting, and people forget these were ordinary people with blood coursing through their veins who did some heroic things or lived in particularly intense times, and God called them to service in Jesus’ name in particular ways. Saints were sinners as well. They were imperfect, they were flawed, and yet God used them to do heroic things. I think that we can all find some inspiration in that. 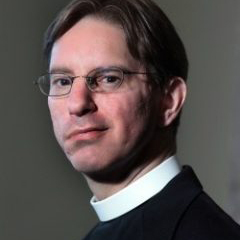 – David Paulsen is an editor and reporter for the Episcopal News Service. He can be reached at dpaulsen@episcopalchurch.org. This interview was lightly edited for clarity and condensed. Love these guys — and their inspiring work. Thank you Tim and Scott. Indeed, these SAINTS are GIANTS! The photo says it all. (Hi Scott)! This is my third year of Lent Madness, and it just keeps getting more intense! I love learning about the various saints, and the comments of Tim and Scott, along with the comments of all the participants, make for an enlightened and energized Lenten season. If you haven’t been participating, please check out Lent Madness 2017 (go Florence Nightengale for the win!!). Glad to see Lent Madness recognized; learning about saints is amazing and ispiring! I love Lent Madness! These saints were ordinary people doing extraordinary things in often difficult times . Thanks so much to Tim and Scott for bringing these men and women into the light for us. We need to be reminded of the good that has been done in this world when so often we hear only the bad. This is my third year, and in the manner of a new convert, I’m always proselytizing about Lent Madness! It definitely brings a new dimension to Lent, and I know we all appreciate the hard work Tim and Scott put into organizing it. And a little humor always helps the Lent go down! Love Lent Madness! I think Tim & Scott rock! Perhaps these two men of the cloth can come up with a light hearted game for Good Friday? This level of pastoral and theological immaturity is truly appalling.